I'm Aleena. When I was 11 I started my own business. I donate a portion of all sales to charity...or "Aid" rather. We've raised over $2,500 for children with cancer so far. With help from family and friends we plan to do a lot more. So help us do some good "one sip at a time". This is our newest flavor and is a quickly becoming a fan favorite. Just like all of our other LemonAids this amazing beverage is made fresh daily with only the freshest strawberries. We do not skimp on the fruit, in fact we use over a pound and a half of strawberries for each gallon we make. This refreshing LemonAid is our flagship and signature beverage infused with fresh cut cucumbers. The cucumbers offset some of the sourness of the lemon leaving your tastebuds with just the right amount of awesomeness. You may not think they go together, but trust us and the many that have tried it, they do. This beverage is an excellent way to quench your thirst and beat the summer heat. Each gallon of our watermelon LemonAid contains more than 15 cups of freshly cut watermelon. That means if you love watermelon, you won’t be let down with this beverage. For the big kids or even the adults that still love a Snow Cone, our large size is perfect for you. We offer 7 flavors that will not disappoint and the snowy goodness of shaved ice on a hot summers day is unmatched. Just like our smaller version the ice is shaved just prior to us opening the stand. Each Snow Cone is served in a colorful flower cup with a spoon straw. Not sure what more to say than “Snow Cone”. Everyone loves a snow cone and we have 7 of the most amazing flavors to accompany your mountain of ice. All ice used in our snow cones is shaved just minutes prior to opening the stand. Our small size is perfect for a small child and a great way to cool off in the hot summer. Each Snow Cone is served in a colorful flower cup with a spoon straw. Having a party or just really thirsty? Get your favorite LemonAid flavor but in a larger cup...we mean jug. When submitting your order please list which flavor(s) and quantity of each along with your full name and phone number. Purchase 3 or more jugs at a time for $9 each. Is the official ice ice baby at the stand. She handles all ice for the cups and snow cones. She is the brains behind the operation, good or bad. She loves her family, music, and sports. Her favorite football team is the Denver Broncos. If there was a master builder certificate for MineCraft she would have one. He is also known as the flagger downer, the cashier, and dancer. He is really into sports, his favorite football team is the Arizona Cardinals. He has a huge personality and will make almost anyone laugh once they get to know him. Don't be surprised if one day you show up and he is dressed as a giant lemon. Hello, my name is Aleena Valdez. I am living the Lemon”Aid” life as the 11 year old business owner of Aleena’s LemonAid Stand. 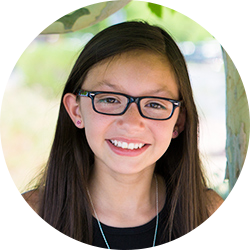 Aleena’s LemonAid Stand got started just over a year ago when I would make a cucumber lemonade for family events. Everyone loved it and would tell me, “you should sell this”. In the summer of 2013 I did a lemonade stand a couple times and I was immediately hooked. I wanted more though. I wanted to have more options for my customers at the stand. Snow Cones immediately came to mind as an excellent compliment to my lemonade. I approached my parents and asked them for a loan to start my business. My dad asked me some questions to see if I was serious and then told me to put together a PowerPoint outlining all the costs I needed to start. In addition to start up costs he wanted to see cost per snow cone to make and projected sales and a payback date. Shortly after this I completed the powerpoint and presented it to my dad and he was sold. I wanted to start a business, but I wanted my business to have a purpose. 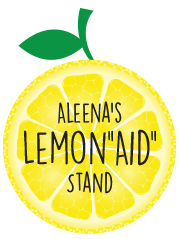 I talked with my dad, who talked with friends, who then talked to me, and then the name Aleena’s LemonAid Stand was born. LemonAid spelled with “Aid” because a percentage of all sales is donated to benefit kids with cancer. For more information on this, please see the donation section. I may be young but have big dreams. I am committed to putting out excellent products, and quality check every batch I make. Aleena’s LemonAid stand is not a gimmick, it is here to stay so please come by and enjoy an amazing beverage that benefits a great cause. My mom is a Registered Nurse on the cancer floor of a local hospital. I’m very proud of my mom and her work. She is one reason I donate to help kids with cancer. It was important to me to help kids. For this reason I chose donate to Phoenix Children’s Hospital. The money I donate goes to the cancer floor of the hospital. The money we have donated so far has been used for books, toys, and anything else needed for the playroom there. 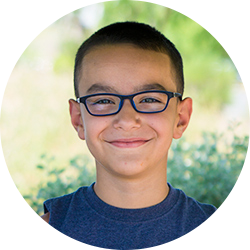 If you would like more information about donating to Phoenix Children’s Hospital, please feel free to email me. We've donated over $2,500 so far!